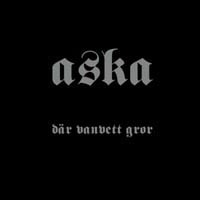 The underground Black Metal band Aska is back with their first fullength album! After their raw demo "Förintelsehymner" so was re-released on both tape and M-CD 2004, their split "The Purest Cold Precision" with Blodulv same year and their split 7"-EP with Hypothermia last year so have Aska build up a name in the underground Black Metal scene! The album is mixed and mastered by Malefic from Xasthur! Limited to only 500 copies and came with a insert with the lyrics!